At 11:42 a.m. local time, a magnitude-5.4 earthquake struck California just east of Los Angeles. At this time, no significant damages or injuries have been reported, although at least 20 aftershocks have hit the region and more are expected to follow in the coming days and weeks. 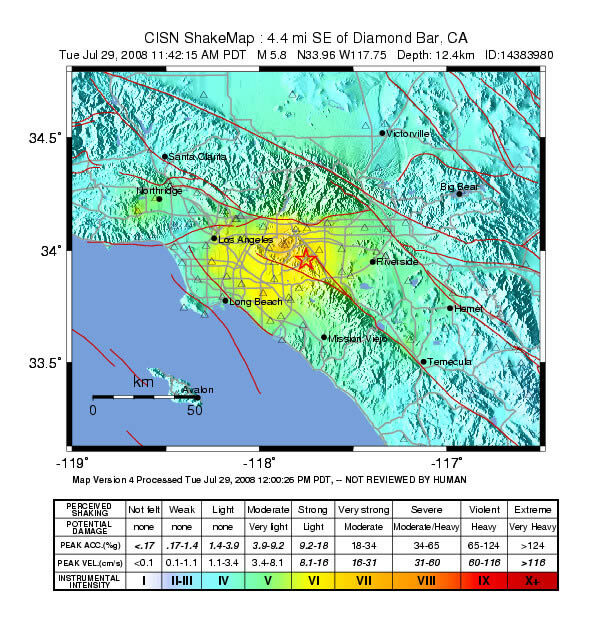 According to the U.S. Geological Survey (USGS), the initial tremors were felt throughout much of the Los Angeles basin and up to 200 kilometers away. The earthquake occurred at a depth of approximately 12 kilometers belowground, although the exact location of the fault where the slippage occurred has not yet been determined. John Bellini, a geophysicist with the USGS, expects the epicenter will be triangulated by the end of the day. USGS categorizes quakes of this size as moderate. They can sometimes cause structural damage, but due to California's strict building codes, little damage has been reported from today's quake. The shaking, however, was widely felt. Robyn Kelly, a geologist for an environmental consulting company in Los Angeles, felt the quake. "There was a bang with immediate shaking. I thought initially either someone slammed a door or a truck was rumbling by, but then it got bigger," Kelly says. "It felt like being on a rocking ship. I actually started to feel a little queasy." "Quakes like this are one of the hazards of living in Southern California," Bellini says. "It's important that people be prepared and know how to react in these situations," he says. This shake map shows the areas affected by today's earthquake, which struck just east of Los Angeles (red star). Yellow represents areas with stronger shaking, fading to green and then blue.